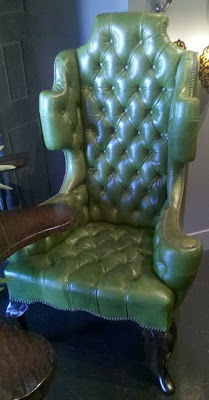 I absolutely love a classic wing chair, so much so that I have not one but two in my apartment. It would be nice, of course, to have them flanking a roaring fireplace, but alas this fantasy will have remain just that. My faux fireplace might be chic, but it's not very toasty. The wing chair that has been on my mind over the past few weeks, though, is the one featured above, part of the Coup Studio Collection. (You can read my blog post about it here.) I love the eccentric shape of it, especially the wings that seem to flare back and that notched top. (Probably not the correct technical terms, but that's the way it looks to me.) Although this particular chair is new, its shape isn't. As I wasn't familiar with this style of wing chair, I consulted Barry Hutner of Parc Monceau Antiques. 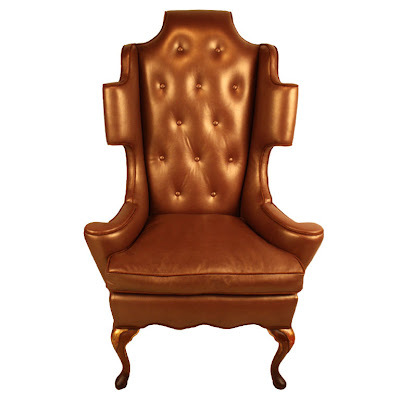 Barry informed me that this wing chair is William and Mary style with overscroll cresting and overscrolled arms. 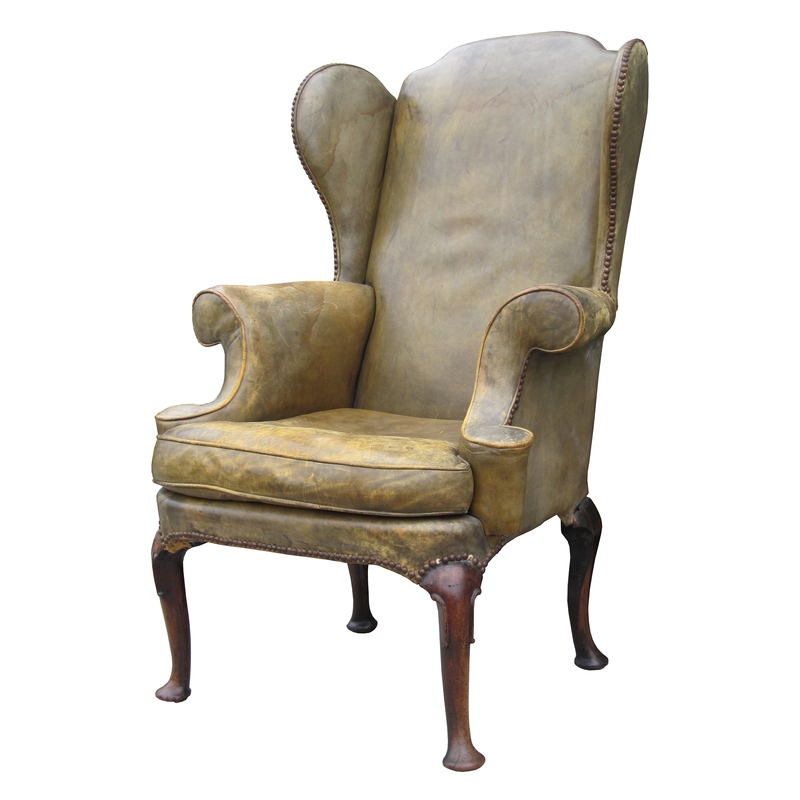 It's not a wing chair that you see very often, something that made finding examples of it rather difficult. 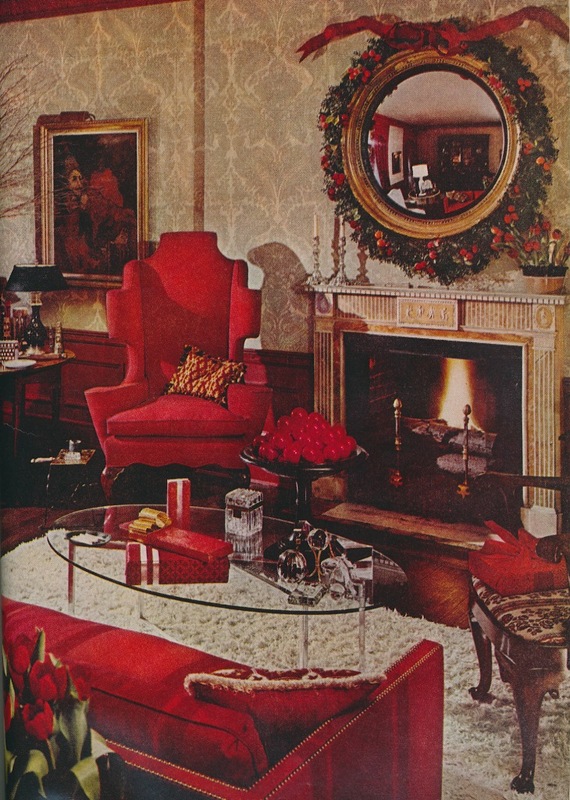 I was able to find two photos of a William and Mary wing chair in situ. (And honestly, I can't tell if the chair in the Castle Howard image is a William and Mary chair or not, but the shape does look similar.) In the photo immediately following the text, the bright red chair stole the show. At Castle Howard, well, not so much so, but the chair did have major competition from the room's architecture. Anyway, it's a chair that I personally would like to see more of. In fact, I'm even hoping that it supplants the now ubiquitous porters chair as the new "it" chair. Now, who wouldn't want to cozy up to this chair? 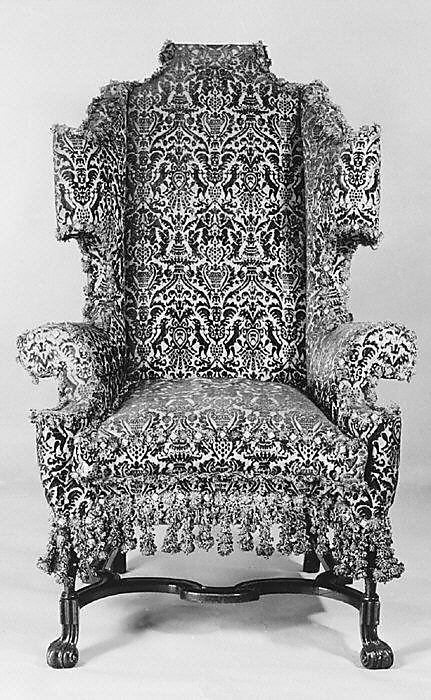 I believe that this chair might be the same reproduction piece as that below, only upholstered in a different fabric. A 1950s reproduction wing chair upholstered in copper colored leather on the front with copper metallic chenille on the back. Available through Modlife. An antique wing chair of some type at Castle Howard. 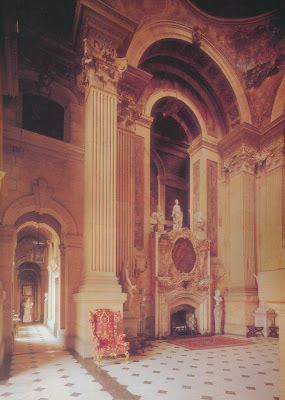 Castle Howard photo from "The Great Houses and Finest Rooms of England" by Robert Harling; the photo of the red wing chair is from a 1970 issue House & Garden. I normally LOATHE wing chairs and when I saw your William and Mary example it was double yuck. However, Barry's custom wing chair (bottom picture), that I could live with, upholstered in Claremont's Parma Damask. Some purists insist on using wing chairs only in private areas, such as bedrooms, contending that it is keeping with the original intent - as a potty chair. But I think, today, the high back and sculptural shape can be an asset to a room of any sort. What a statement piece! Wish I had a space big enough to house the impact of a chair like that! I love wing chairs. They are a favorite for me and I just adore how they look! 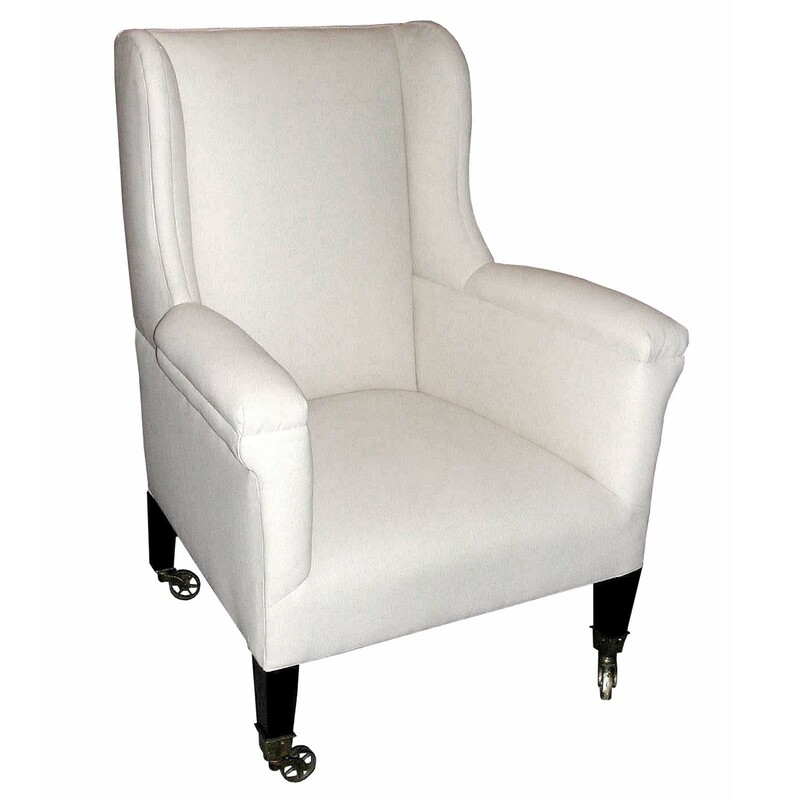 The nice thing about wing chairs is that there is a shape to suit almost anybody! Wing chairs look terrific in period films and in great halls such as that at Castle Howard but unless they're scaleddown, always strike me as simply Too Much Chair. Colefax used to make one after a model owned by Nancy Lancaster that was understated and compact. And I once saw an old leather wing chair in their Brook St window which had red silk tufts~a charming and unexpected touch. I inherited a pair, one was william and mary, I'm not sure of the other's origin. I covered them both in the same mossy mohair, and they went from feeling stuffy to sumptuous. 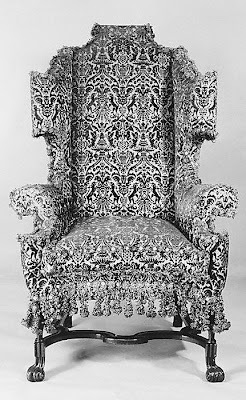 Upholstery can make such a difference, I love how fresh the damask makes that chair in your image look. I just read your post on Oscar de la Renta's amazing talent with blue and white, I agree absolutely! Great post. I LOVE WING CHAIRS! The William & Mary example has a great visual appeal that I think would look handsome in a room today. These wing chairs are like people! they all have such distinct personalities and provide such great 'sculpture' to a room! I so agree about the appalling porter chairs. I remember them from the seventies and they are as ugly now as they were then. Why someone would even consider putting one in a living room .... but don't get me started. I suppose putting one in the hall would be the thing to do - about as real as having a butler's pantry where there is no butler.